www.photomacrography.net :: View topic - FAQ: How do you illuminate your subject? FAQ: How do you illuminate your subject? Posted: Sat Sep 05, 2009 5:40 am Post subject: FAQ: How do you illuminate your subject? "Could I ask specifically about Very Close work. How short a Working Distance have you managed to use, with what lighting?" My shortest WD (9.2mm) is when using a Nikon CF N Plan Achromat 10/0.3 objective. I use 3, SB-R200 flashes and place them as close as possible to the lens. Controlled wirelessly. Image below. With the flashes so close to the specimen I can use the flashes at way less than full power - makes it economically feasible, battery wise. 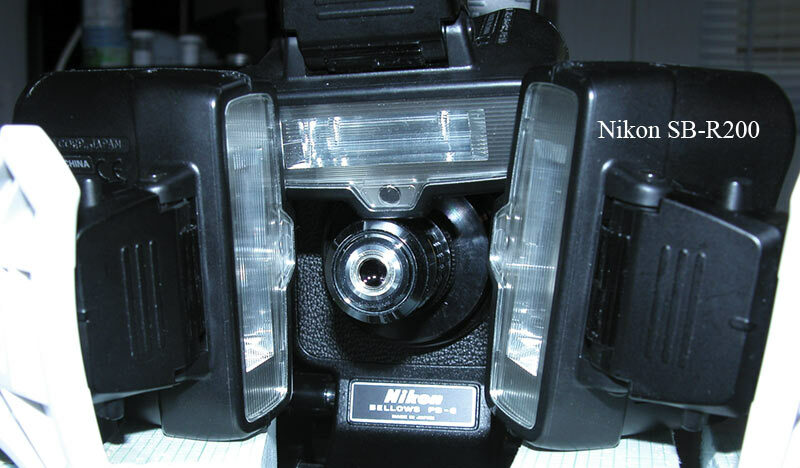 In fact, I am now using this setup (1 flash on top, 1 on each side) with all my lenses. All exposures are 1/250 sec with flash. NikonUser, I know this post is 5 years old. But I have some questions for you. I notice that you have the objective mounted on the PB 6 bellows Did you need full extension of the bellows ? Are you using the same lighting now ? Was this setup used with a Nikon D90 ? Has your setup evolved ? Thanks. I don’t recall that setup but it is one I must have used. Currently I surround my subject with a Styrofoam cup, or part of a cup (depends on specimen size), and use 1 or more flashes. Those SB-R200 use expensive batteries so my 1st choice is to use a single SB-800 ( 5 AA batteries). I find that a vertical system using a microscope base is far more useful and versatile than a horizontal system (I have both). I now use a Nikon D6100 instead of the D90.